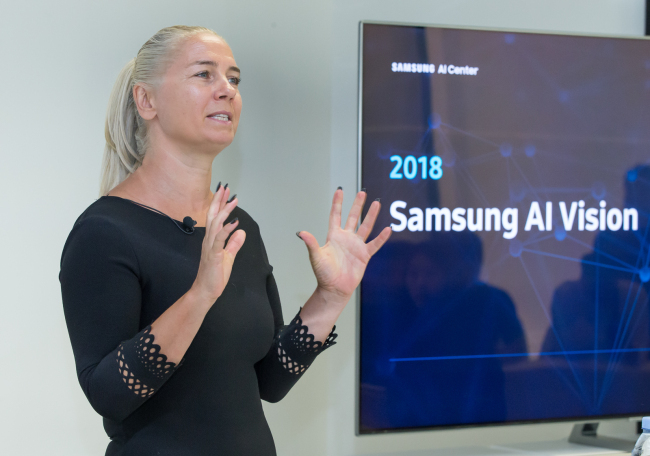 LONDON -- Samsung Electronics will become a leader in the field of artificial intelligence by differentiating itself from other AI players with human-centric communication that will help devices understand users’ emotions better, said professor Maja Pantic, who is affiliated with a UK-based AI center for Samsung, on Tuesday. “Samsung’s devices will ceaselessly communicate with users and learn from them through the screen, voice, vision and tactile features,” said Pantic during a press conference at Samsung Design Europe in London. Pantic is a principal professor at Imperial College London and Samsung’s AI Center in Cambridge, which opened on May 22. She is one of the research leaders at the center along with professor Andrew Blake from Microsoft. Pantic’s works focus on affective and behavioral computing field. Samsung currently runs five AI Centers, including the Cambridge center, in Silicon Valley, Toronto, Moscow and Seoul. Samsung chose Cambridge for the newest AI research center because of the region’s long history of mathematics and science, as it is home to renowned universities. Global AI developers like Microsoft, Apple and Amazon are launching similar AI centers there, too, making the area the British version of Silicon Valley. The Cambridge center’s research focus is on emotion recognition technologies and embedded AI that works without cloud, with a goal of engaging AI in human-like communication. Human-like communication requires extensive understanding of users’ facial expressions, gestures, nationalities, gender, age and cultural differences. By being able to recognize users’ facial expressions, AI would be able to predict what users want to do. It could even help prevent mental illnesses like dementia and depression, Pantic said, by analyzing subtle changes in users’ facial expressions, gestures, emotions and other behaviors. The professor said she joined Samsung because of the company’s priority for security, unlike other companies.